28th July Indian Express brought another dose of Bhallanomics: *Worse Than Hindu Rate of Growth*. The article makes a small *Big Point* in a laborious way. The following table summarises his exertions briefly, yet wholly. 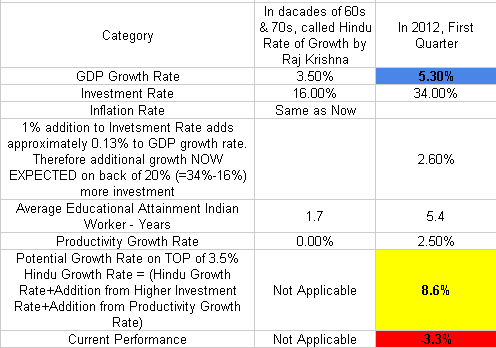 In a sentence, compared to the *pre-liberalization* era’s 3.5% Hindu Rate of growth, today, the economy should deliver a minimum of 8.5% GDP growth on the back of increased investment rate & improved productivity rate, and not 5.3%. The two mistakes or approximations (34%-16%=20% & 6.1%+2.5%=8.5%) were noticed, but may be safely ignored for the purpose of discussion. 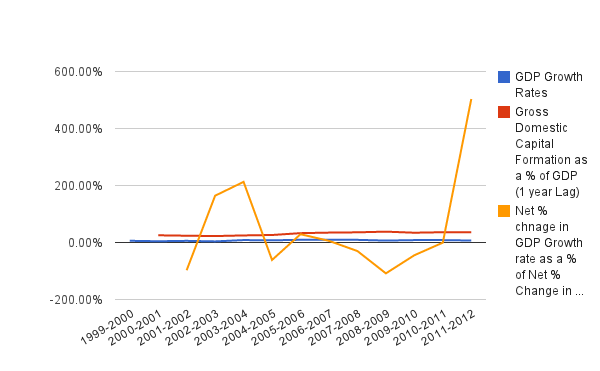 The data presented in tables below has either been taken from Planning Commission or from World Bank Websites. What Bhalla’s column has suggested is that Indian Economy is at the minimum performing (-)3.3% below its potential compared to pre-liberalization era. The *subsidies*, *higher procurement prices for grains* and *MGNREGA* are the usual suspects he rounds up for decrying the Congress Government’s Economic Management. Present column is no exception. The point here is not to argue whether policies of the present government are bad or good, but has he argued the case reasonably and adequately? It turns out that the *Mega* Macro analysis is based on wafer thin data. There has not been any major policy shift in the two avatars of the UPA government. Some of the highest GDP growth rates were achieved in 2005-06 to 2007-08, and even in 2009-10 & 2010-11 under the same policy regime. The major dip in 2008-09 occurred due to the seizing of global credit in the wake of financial crisis caused by the *exotic derivative products* (called by weapons of financial mass destruction by a much revered investment Guru). The capital formation rate (or investment rate) is comparable for these years (except 2007-08 when it spiked up) to what it is today. On the other hand, the Exports & Imports Share, which he claims is now close to 60% [<<The export plus import share is now close to 60 per cent, more than three times the level earlier. As expected, this has effects on productivity of labour and capital and therefore the aggregate growth rate.>>], were much less ranging from 41% to 45%. 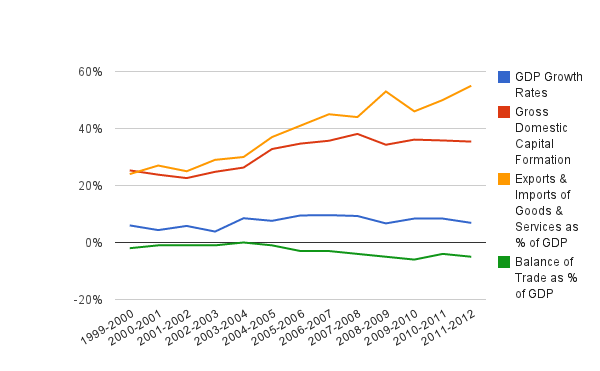 The average educational attainment over this period of 7 years (2005-2012) was same (The figure of 5.4 years is taken from Planning Commission data set of 2007-2008). 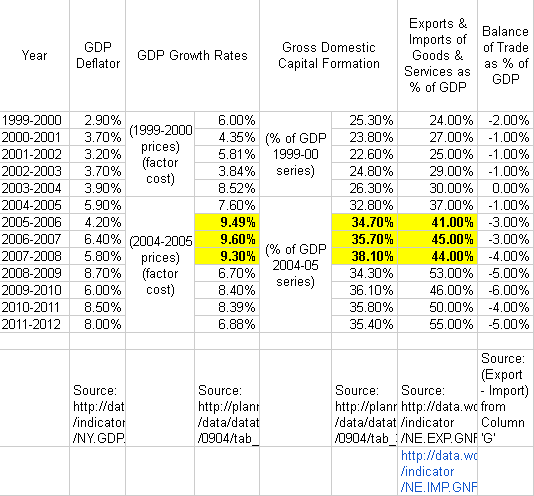 Yet, the GDP growth rates were above 9% (for 3 years) and above 8% (for 2 years). When his argument doesn’t take into account this contradictory feature, let alone account for it, on a shorter and much more comparable span of 7 years; why should anyone believe his *analysis* over a much larger & vastly incomparable period of 50 years. One must also take into account in subsequent years the worsening balance of trade & depreciating rupee that have added to inflationary pressures. In 2008-09, the exports & imports as % GDP showed a large spike up (see chart), when GDP growth rate moved sharply southwards. Also in last 2 years external trade as % of GDP is firmly moving northwards when GDP growth rate is dipping. Therefore, the positive correlation he seeks to draw between these two rates is at best tenuous. 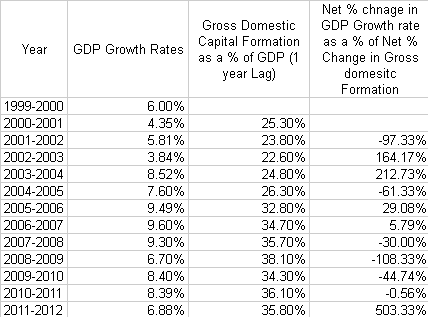 Lastly, a comparison of the (net) % change in GDP growth rate year on year (yoy) with (net) % change in capital formation as % GDP yoy, throws up a wildly divergent data set. Though, capital formation rate is bound to affect GDP positively, it would be highly facile to base any highfaluting conclusions ignoring the complex interaction of other factors.